Alexandra Grieß: born 1977 in Hameln/Germany, living in Hamburg since 1995, 2001-2004 studies visual communication at the HAW (University of applied Science in Hamburg, Germany. Since then working as an (Sound-)Artist, DJ and Photographer. 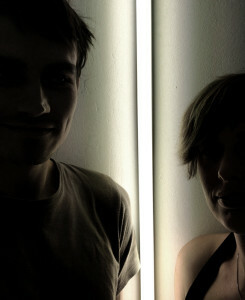 Alexandra Grieß and Jorel Heid are working together since 2011. They create rooms, where the walls are fragile and expand rhytmical, or spread out in the dark. Most of their works are isolating an observation of nature. By reducing them into black or white/light and nonlight, they emerge a graphical clarity.